Highlighting tremendous scope for private investments in rail projects, Railway Minister Pawan Kumar Bansal invited private companies to participate in such ventures including the Dedicated Freight Corridor. Advocating the need to de-clog the road network in the country, the Union Minister insisted transporting bulk goods through rail instead of roadways as it would be cost effective and environment friendly. "The 570 km long corridor from Sonnagar to Dankuni in the Eastern DFC will be executed through PPP route," Bansal said at a conference in New Delhi. The Eastern and Western corridors of DFC are being constructed covering a length of 3,328 km route for exclusive freight movement in the country. per cent land has been acquired. It would cost about Rs 95,000 crore (Rs 950 billion) including land acquisition cost." Highlighting the importance of the DFC, he said, "We need DFC as it is for the growth of our economy. In order to meet the growth we need to encourage private participation." Currently, the share of railways in goods transportation is 36 per cent whereas in the US and China the share is 48 per cent 47 per cent respectively. Comparing with the road carriers, Bansal said: "One freight with 59 wagons and one electric engine of 5,000 Horsepower to 6,000 Horsepower would carry 4,600 tons while 400 trucks of each of having 150 Horsepower carrying 10 tons are required to carry the same load." 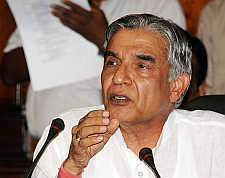 Bansal said the movement of goods on rail is six to 10 times more efficient as compared to its impact on environment, long queues at toll plazas, the time factor and the additional cost involved on roads.